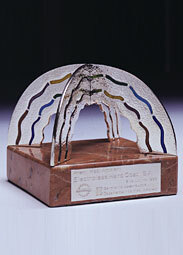 Award from Catalan Government in recognition of “a unique action for the environment”. Potentially, the plating industries can arrive to be very polluting, due to their capacity to generate waste and wastewater with a high concentration of heavy metals. The decisive factor that drove the company to realize this project for the environmental protection was the desire to reduce the amount of waste generated, by vacuum treatment, which made possible the zero discharge of wastewater. 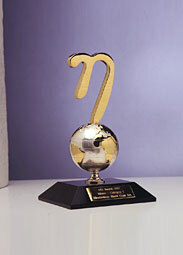 The UNIPEDE Award in recognition of energetic efficiency in our production processes. Elhco implemented a pioneering waste treatment system which archives to concentrate at maximum the liquid waste to obtain a solid mud, using a circuit of vacuum evaporators. From this, very good quality deionized water is obtained, which is reused in the industrial processes. This system has reduced the costs of water, sanitation fee, the amount of reagents, discharges of wastewater and a reduction to 50% of the discharging sludge. 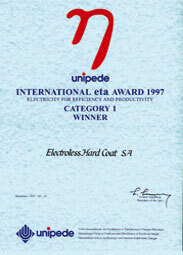 International Union of Producers and Distributors of Electrical Energy (Paris) founded in 1925 and established in 57 countries, of which 37 are European.